Another year, another Memorial Day, and another trip to Indianapolis for the 500 and while I was looking forward to friends, drinks, and race day, I had one thing on my mind as I pulled onto 465, dinner at St. Elmo’s. In years previous, I had heard about St. Elmo’s and their sinus searing shrimp cocktails, but last year reservations were unavailable. To rectify that mistake, I started early and booked a table in March. There was no way I would be skipping the Indianapolis landmark on this trip. With Kyle finally finished with his airport ordeal and Liz ready to go, our trio was out the door and making the short drive downtown. Then it was the actual matter of finding the restaurant. Valet fee paid, we walked inside to find our table not quite ready, but before we could pay for our drinks at the bar, our buzzer rang. Weaving through the sea of humanity, we were led downstairs. Dungeon, basement, or wine cellar settings aside, it was a relief to finally be able to see what all the fuss was about at St. Elmo’s. Before anything resembling a steak would reach the table, it was time to shine the spotlight on the true St. Elmo’s claim to fame, the shrimp cocktail. Our waiter was proud to report that St. Elmo’s sells the most shrimp cocktails in the United States. Beside the novelty, I can completely understand why. This cocktail is built on large, 21-25 or bigger, shrimp that are well cooked, briny, and have a pleasant snap with each bite. 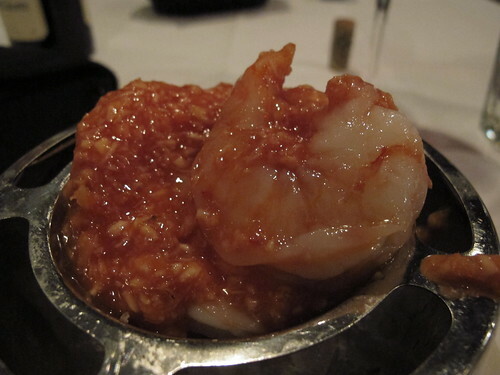 However, the shrimp were almost relegated to a simple foundation for the cocktail sauce. Composed of 90% horseradish and a little cocktail sauce for color, this sauce, as you might imagine, has a bright horseradish flavor which quickly evolves into a searing arrow to your sinuses. Rumors on the internet claim the cocktail sauce is nothing more than freshly grated horseradish, soaked overnight in vinegar, strained and mixed with Heinz ketchup. True or not, you may need an extra napkin to eat this shrimp cocktail. Each bite carried a potent, burning punch, but it was a good burn that left you wanting more. Steaks on their way, a course of soup was next. Given the choice between tomato juice and navy bean, I stuck with the bean. 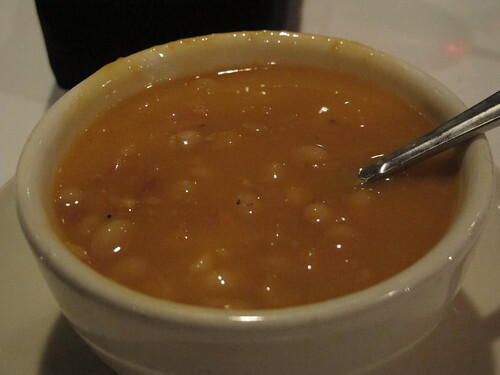 Tomato, pork, and beans, a lovely trio for a simple soup. With the added bonus of the beans bursting with the slightest bit of pressure, it was a perfectly fine mid meal interlude. 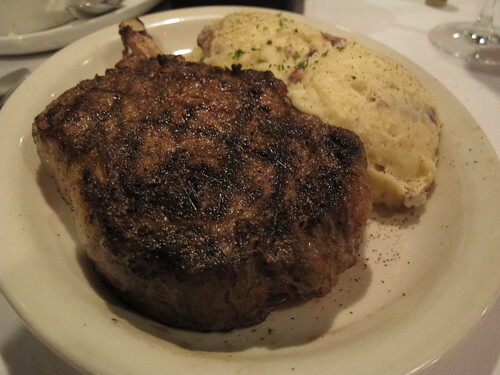 It may seem a bit odd, but after the shrimp cocktail, the arrival of cowboy ribeye was almost anticlimactic. 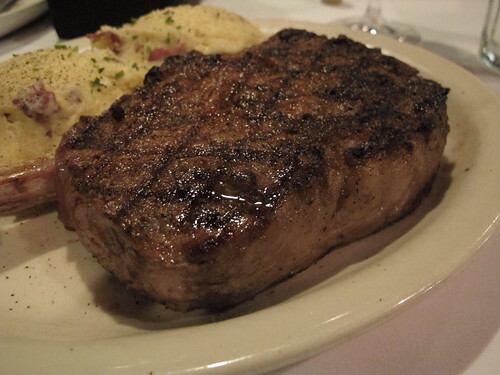 Corn fed and wet aged, this steak was well seared, complete with perpendicular grill marks. On the exterior the steak seemed to be nicely seasoned. 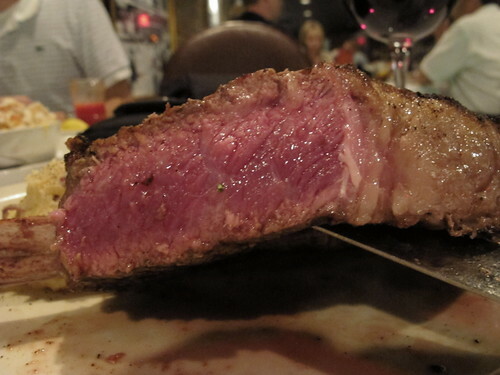 Inside, you can tell this steak had not seen the warm waters of an immersion circulator. A fair gradient of temperature surrounded the medium rare center. All together, this was a decent steak, but by no means great. Without any big, beefy flavor or even a stiff shot of black pepper and salt on the crust, this steak was a bit of a letdown. 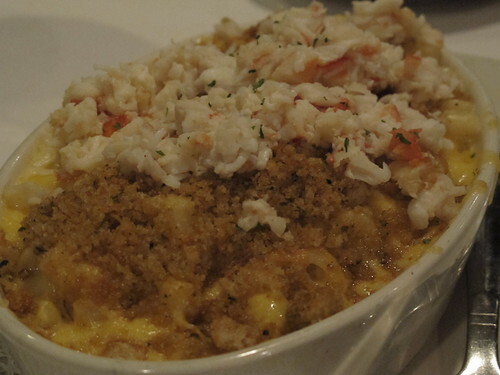 As an extra side, I couldn’t resist the allure of king crab mac & cheese. 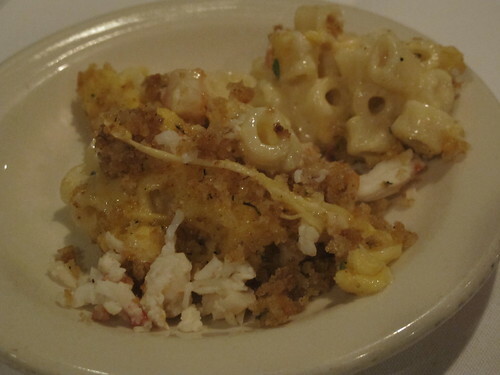 The crab topping and toasted bread crumbs were a nice touch, but I couldn’t get past the completely overcooked noodles. Overdone noodles or not, this mac and cheese was still full of the requisite cheesiness that was only augmented by the delicate flavor of king crab. 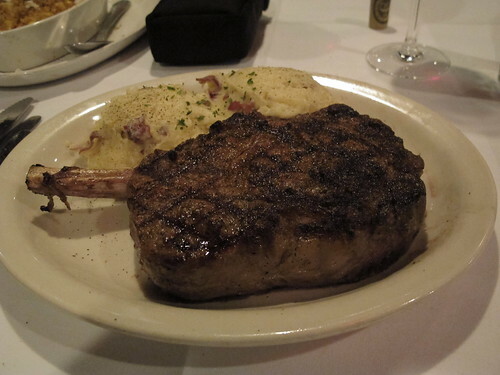 In retrospect, I had a feeling that St. Elmo’s might come up short on the steak end. It really seemed that everyone I talked to would rave for hours about the shrimp cocktail but never mention the steaks. To be perfectly honest, I would happily make another reservation to get another dose of fiery horseradish and succulent shrimp, but I’ll skip the steaks and check out the other entrée options. I’ll be the first one to admit that I don’t know much about the city of Louisville, Kentucky. Outside of a few days in 2004, I've done little more than drive through the city in the past eight years. However, this year, while making my annual pilgrimage to “The Greatest Spectacle in Racing”, I decided that I needed give Louisville a little more attention. Sadly, that meant a stop for lunch at the most. After a little research and a helpful Eater email, I set my sights on the part of town Louisville known as NuLu and Rye. After finding parking and being shown to my seat, I had a chance to look Rye’s menu and I noticed an introduction on the back. our own fish, butcher and cure our own meats and press our own juices. Second, food is our community. 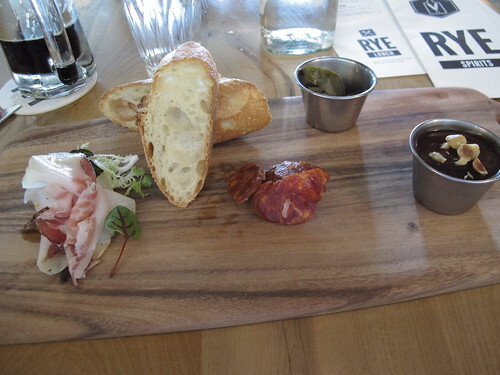 Our menus change daily thanks to our network of farmers, artisans, purveyors and the Rye staff. We strive to include the most fresh and inspired ingredients from anywhere, everyday. Trust us that when you dine at Rye, our eyes and hands have met every ingredient of every bite and sip. While this isn't the first time I've read something like this from a restaurant, but I've never seen so much menu space devoted to it. It may sound a little hokey, possibly a bit sanctimonious, but I find a small measure of comfort when a restaurant takes care in every step of the dining process. Of course, not every place can live up to their guidelines, so how did Rye hold up to theirs? With promises of house cured meats echoing in my mind, the first thing that was brought to my table was an aptly named meat place. 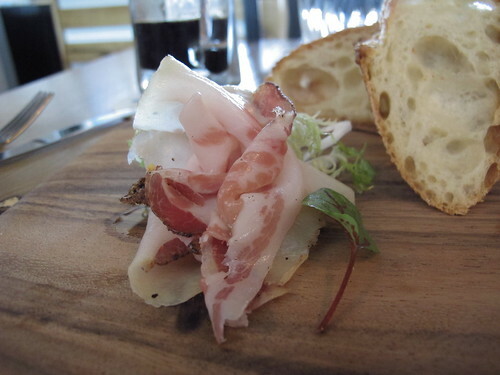 From left to right, guanciale, chorizo, and a cup of chicken liver mousse. Certainly some of the fattiest pork jowls I’ve encountered, these slices of guanciale were silky and rich with a condensed pork flavor punctuated by a bright taste of black pepper. This guanciale was almost as fatty as lardo, but in a sinfully delicious way. 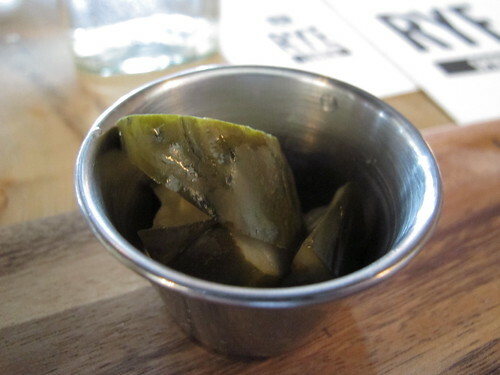 A necessary interlude between pork portions, the pickles at Rye were something spectacular. These thick slices cut through richness of the chorizo and guanciale like a scythe leaving only a trail of chili and vinegar pungency. 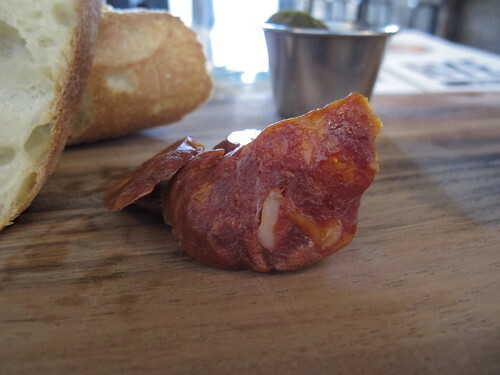 Speaking of the chorizo, this hard, cured sausage was a smoky, deep red with a taste to match. 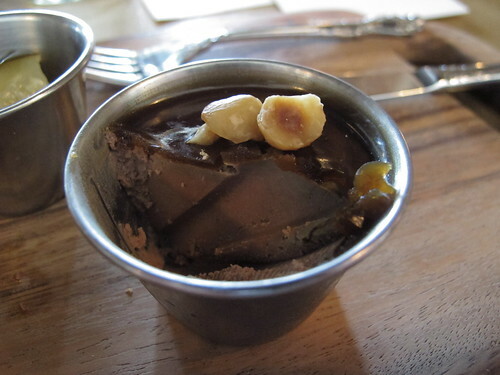 Last in the meat plate was the chicken liver mousse and I wasn't prepared for a chicken liver mousse like this. 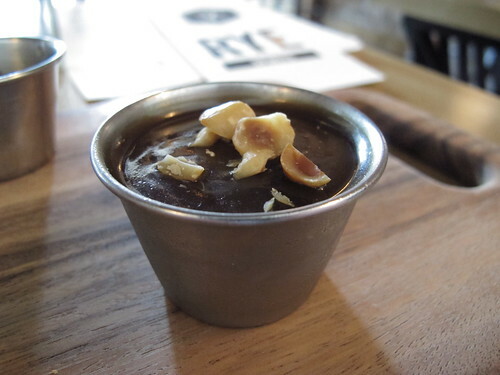 Beneath that madeira gelee was an insanely thick mousse that I almost mistook it for chicken liver fudge. Even spread on a toast point, this mousse was denser, creamier, smoother, and thicker than any I've had before and it was all done without any overbearing taste of iron. 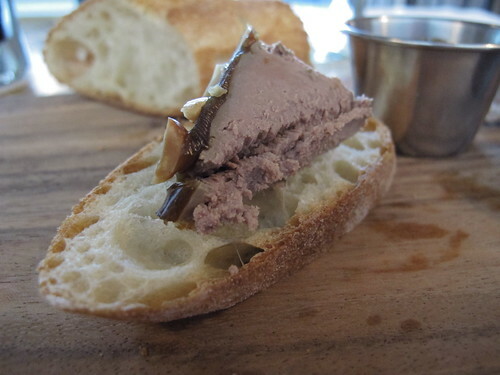 I was later told that the livers had been cooked, ground, and pushed through a chinois, and while that may account for the texture, I think I’ll struggle to find another chicken liver mousse like the one at Rye. Before I spend too much time lavishing praise on the quality of Rye’s cured meats, I’ll move on to the entrée, but first a look at a market side. 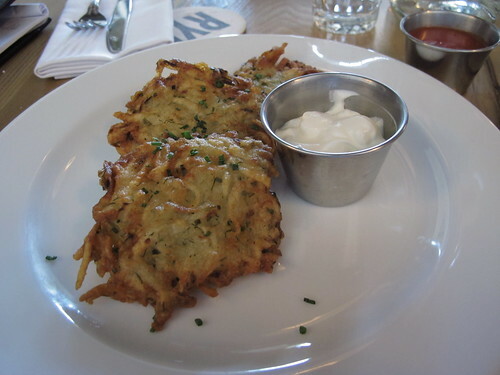 May very well could be the wrong time of year for latkes and crème fraiche, but I’ll be hard pressed to turn down this Chanukah treat, especially when I don’t have to grate and wring the potatoes. 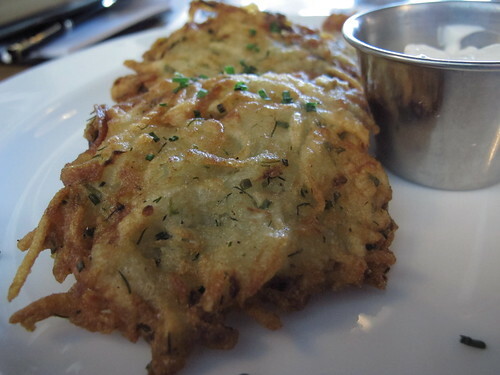 Thick and crispy on the edges, these latkes were a hearty side dish that, while quite well prepared, were in need of a little salt. Even with a dollop of the thick crème fraiche, the need for salt prevailed. 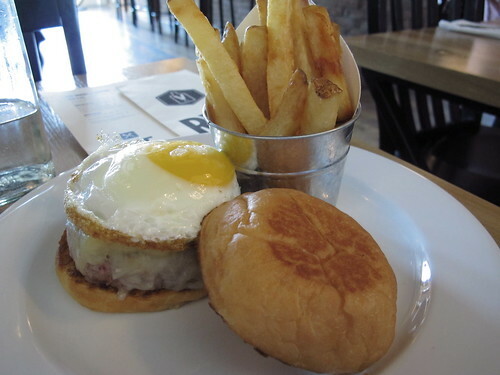 Things came to a head when the Rye burger arrived at my table. Thickly (1/2 inch) cut and double fried, the fries were a stellar side to the burger. 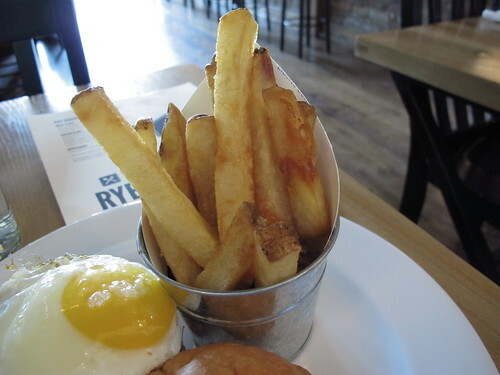 It’s hard to find well-cooked fries, but with a lightly salted, crisp exterior and pillow fluff interior, Rye was up to the task. 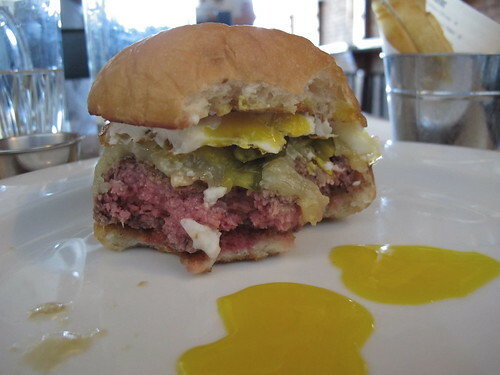 Whenever I see a burger topped with an egg, I know it can go one of two ways. 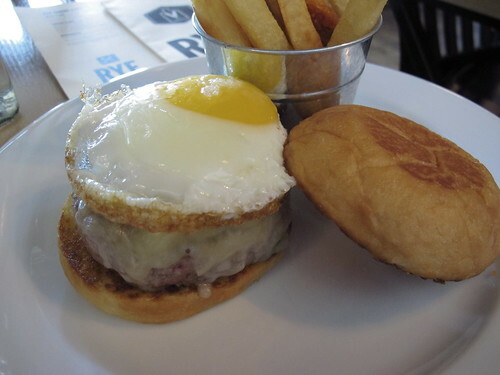 Either the egg is overcooked and drags a burger down or it’s a runny eye and a delightful mess. 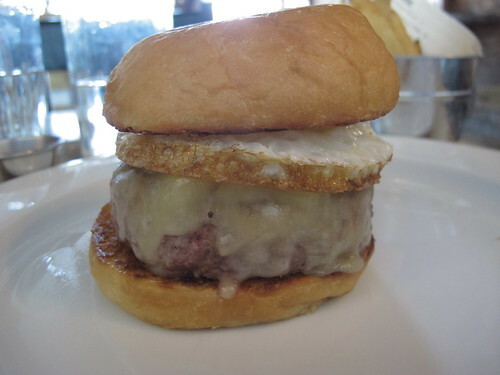 As the wobbly, sunny side up egg gave way, it was a rush of yolk that only reinforced the picture perfect medium rare texture of the burger. 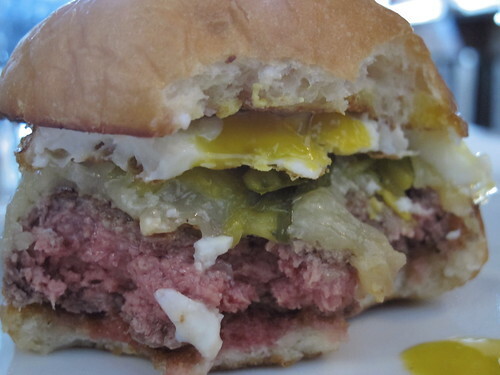 With a stellar patty to bun ratio, artfully melted cheddar and 50% chuck 50% brisket patty, Rye produced a well-seasoned, beefy, and all around excellent burger. I may have missed the deep crust from cooking on a cast iron skillet, but there are few faults to be found with the Rye burger. When I stopped in Louisville for lunch, I was expecting to find a decent meal in an interesting part of town. I can’t say that I imagined I’d find a restaurant that would completely upstage St. Elmo’s later that night. It seems that in the past few years, the south has become rife with farm to table restaurants that celebrate house made products and a local approach to eating and I couldn't be happier. Rye far and away exceeded my expectations and I can only feel ashamed that I didn't stop in Louisville sooner. Pull up to the valet stand, hand off your keys, and step through the art deco doors of F. Scott’s into a world of flapper dresses, jazz bands, and prohibition cocktails. Well, there may be a dearth of flappers inside F. Scott’s, but there are certainly plenty of cocktails, jazz music, and even local farm products. Perhaps I’m getting ahead of myself; allow me to color this scenario with a little nostalgia. I had made it to Nashville for my overnight stay and I was in the mood for a cocktail and new southern cuisine. While there may be other venues for those items in Nashville, I had F. Scott’s on my mind if only for a hazy memory of spring 2003. That was the year Jennifer graduated from Vandy and while I’m short on the specifics, I remember a rather tasty meal at F. Scott’s. Nearly a decade later, I decided it was time to lift the haze and see what F. Scott’s had to offer in 2012. 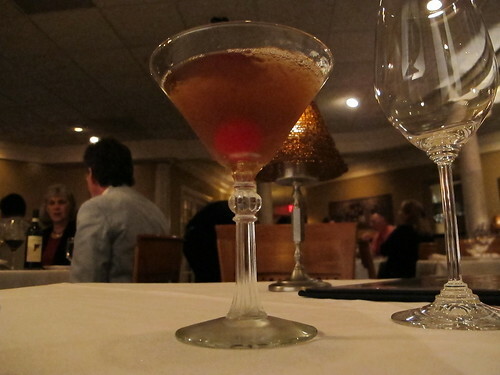 While waiting on my appetizer course to arrive, I decided to indulge in F. Scott’s version of a Manhattan. Rye, sweet vermouth, and bitters truly make for a sublime beverage. 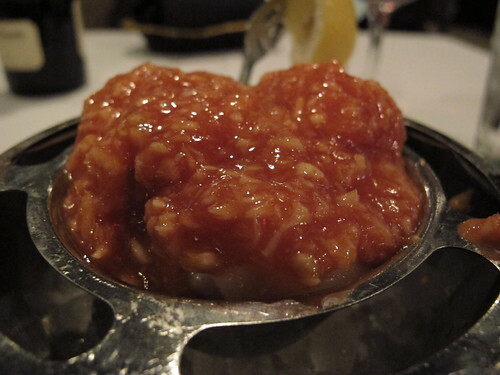 Before I could finish my cocktail, my appetizer of veal sweetbreads arrived. 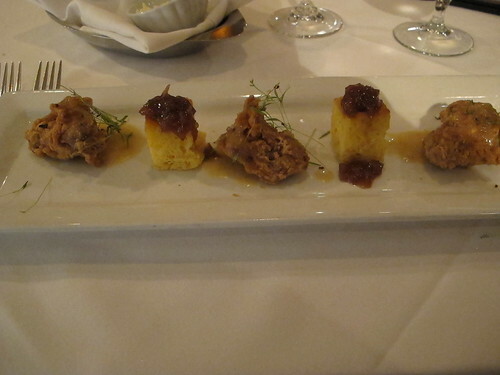 The dark, dinner atmosphere of restaurants plays hell with picture quality, but this plate contained veal sweetbreads, cornbread cakes, Serrano pepper, shallot, and plum relish and a citrus velouté. 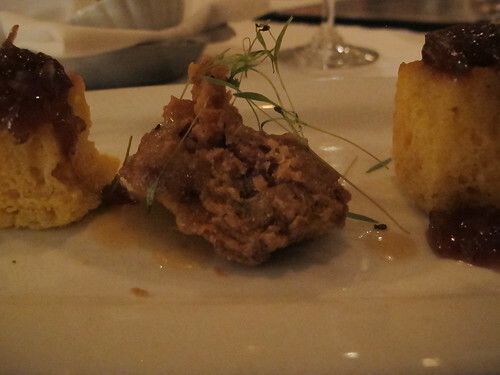 Instead of the usual thin coating, these sweetbread nuggets were wrapped in a thick, chicken fried, and salty batter. While the coating was nicely crispy, the sweetbreads inside were overcooked. 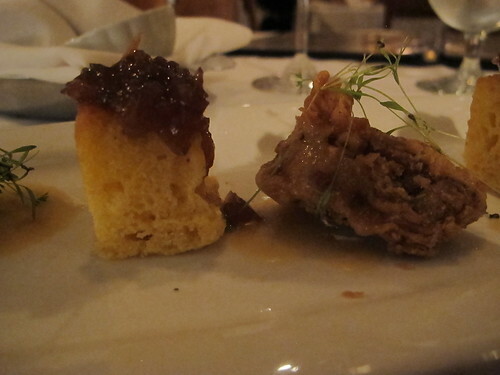 Interestingly, these sweetbreads, while lacking the usual silky texture, weren’t chalky but more akin to the texture of liver, dense and thick but a bit odd. The cornbread was another different story. Each piece was light, airy, and topped with a complimentary smoky relish. 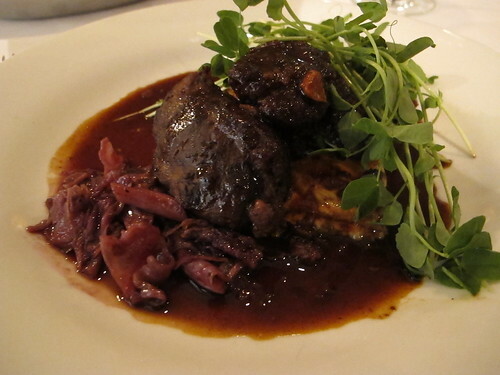 Faced with a variety of tempting entrees, it took a duo of pork to make me decide on the braised pork cheeks. 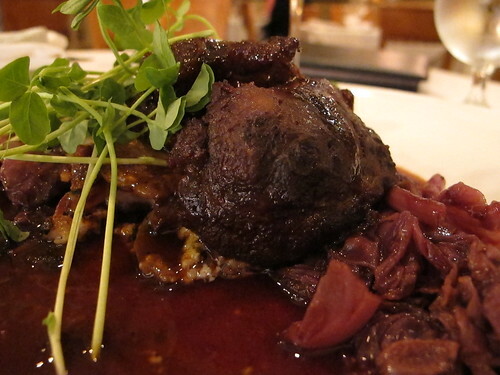 Entirely out of season but perfectly welcome, these pork cheeks were served on top of country ham, spring, onion, and mozzarella gratin with braised red cabbage and fava shoots. The first few bites of the pork cheeks were some of the silkiest and smoothest examples of pork I can recall, but what was, at first, a dark and extremely rich variety of flavors quickly became too thick, heavy, and hard to finish. 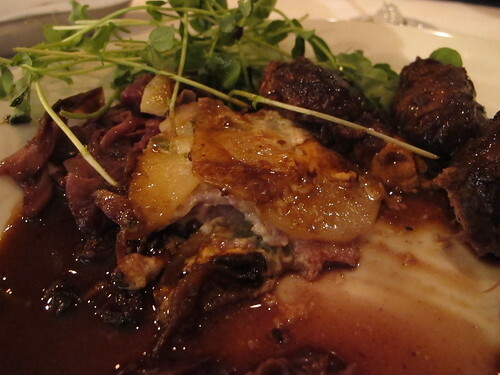 Underneath the pork cheeks, the potato gratin was exceedingly tender and quite salty, proving that even country ham can sometimes be too much of a good thing. I was hoping that the fava shoots would help cut through the richness of the sauce and seasoning, but they proved no match for the bold flavors. This dish would have been well suited for sharing on a blustery winter night but for one person in the May heat, it was simply too much. After complaining to myself about the overt richness of the entrée, I was easily convinced to make the entirely hypocritical choice of pistachio ice cream for dessert. 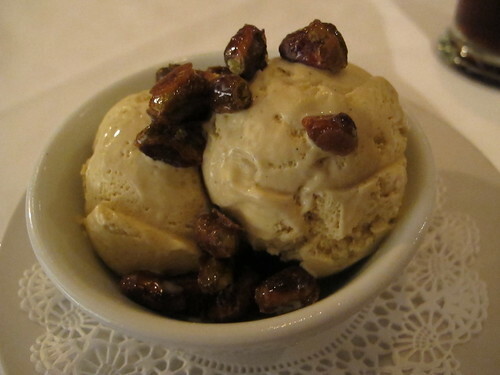 To be fair, turning down the prospect of homemade pistachio ice cream with candied pecans is a difficult decision to make. As you might expect, this ice cream was insanely rich with an exceedingly creamy texture and mouth feel. 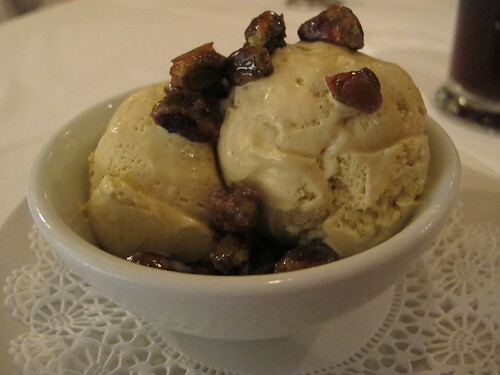 I did enjoy the pistachio flavor and the crunch of the candied pecans, but I was no match for this bowl of ice cream. It seems that the past few times I’ve tried to revisit old memories of restaurants, I’ve come away with mixed results and F. Scott’s is no exception. From the cloyingly thick batter of the sweetbreads to the sinfully dark flavors of the pork cheeks to the creaminess of the pistachio ice cream, each course was a study in excess, and not always in a good way. 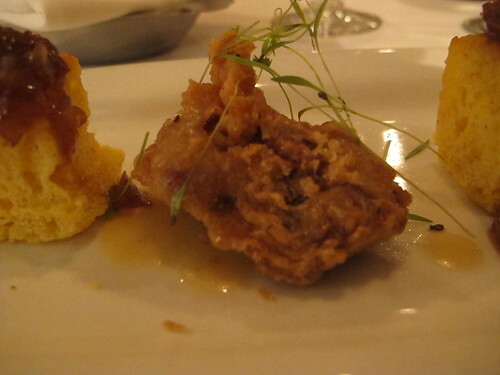 There’s no denying that, with maybe the exception of the sweetbreads, there are excellent flavors at work at F. Scott’s; maybe I should have looked to the lighter side of the menu. Regardless, I’ll be tempted to revisit F. Scott’s the next time I’m in Nashville, but maybe I’ll just stick to a few more cocktails and the fish. As is often the case for this time of year, I was on my way to Indianapolis for Memorial Day weekend. With visions of good times with college friends and maybe a little racing on the side, I decided to stop in Memphis for lunch. Normally this would mean seeking out more of Memphis’ most famous product, bbq, but I had a different plan for this year. 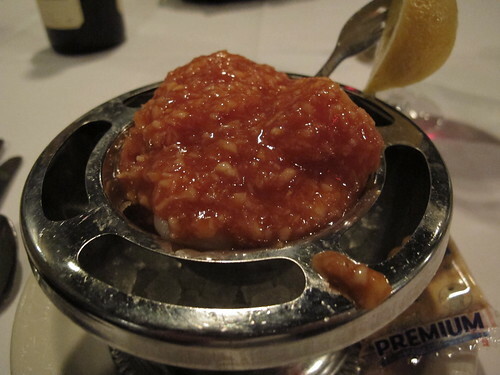 Knowing that any idea of Asian cuisine would be hard to come by in the upcoming weekend, I decided to explore a little of what Memphis had to offer. Being in a bit of a hurry and looking for something reasonably priced, pho seemed to be the perfect answer. Having done a little research earlier in the week, I had found a Vietnamese restaurant with good reviews that wasn’t too far out my way. After a detour off 240 and onto Germantown Parkway, I pulled into a shopping center and stepped inside the cool air of Green Bamboo. Despite the high temperatures outside, Green Bamboo was cool and a little dark inside making the idea of a hot bowl of pho much more reasonable. 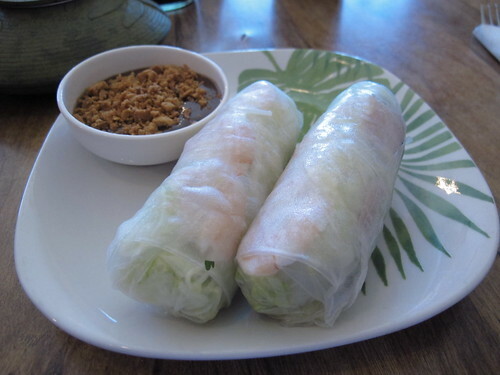 But before the pho, I wanted to see a few of Green Bamboo’s appetizers, starting with the spring rolls or goi cuon. 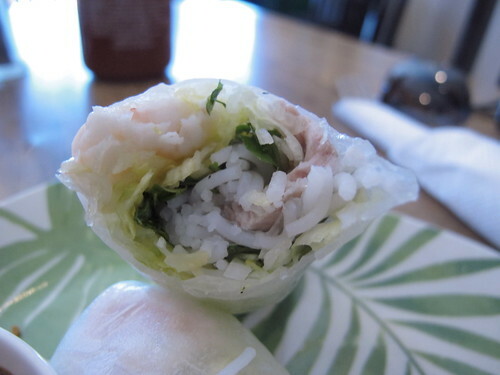 Translucent rice paper and a side of hoisin peanut dipping sauce is a welcome sight in any Vietnamese restaurant. While there was a fair amount of pork inside this roll, what really stood out was the lettuce and the big flavor of mint. Next was a fried version of the rice paper, the cha goi or as Green Bamboo called them VN egg rolls or bamboo egg rolls. Fresh from the fryer, these rolls were hot but not at all greasy. 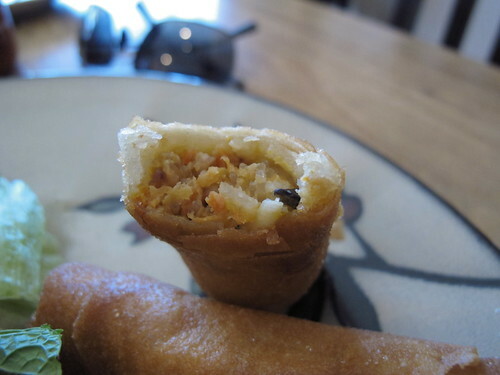 Inside the egg roll was a big meaty flavor that was punctuated by black pepper and a smattering of black mushroom and carrot. 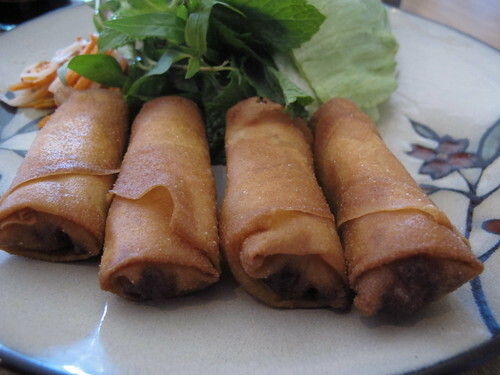 Complimented by a very sweet bowl of nuoc mam, these egg rolls were a welcome appetizer. 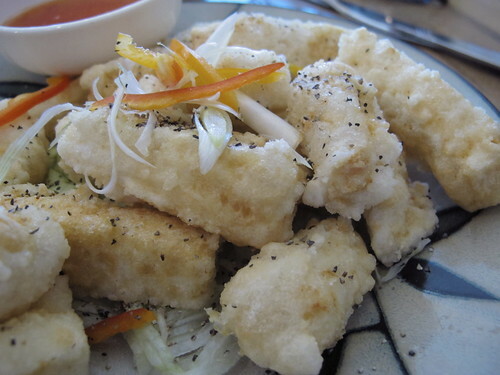 Underrated as far as appetizers go, I couldn’t pass up the idea of an order of fried tofu. Battered, fried, chili salted, and topped with pepper, shredded green onions, and carrots, these thick slices of tofu were both silky and delightfully crunchy. 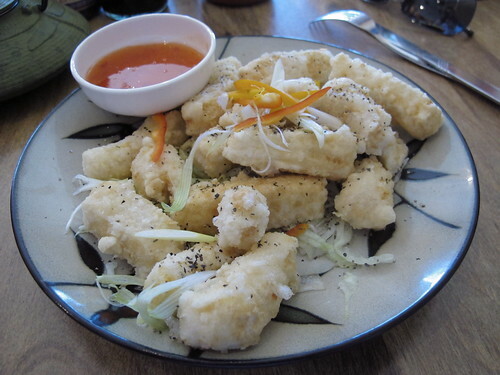 While each piece of tofu did come seasoned with plenty of black pepper and salt, even with a dip in the sweet chili sauce, this is a dish for tofu lovers. 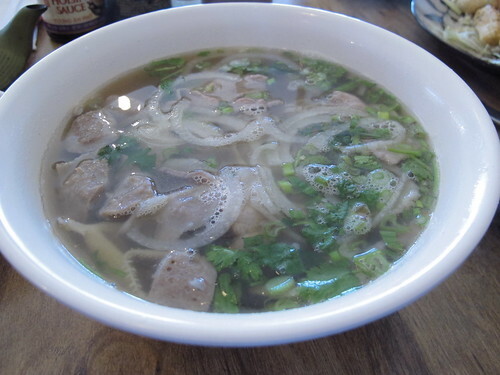 With appetizers to spare, it was time to move on to the main event, a steaming bowl of pho dac biet. 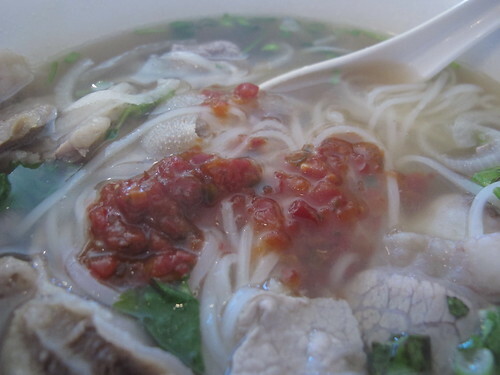 Why do I always pick pho dac biet? 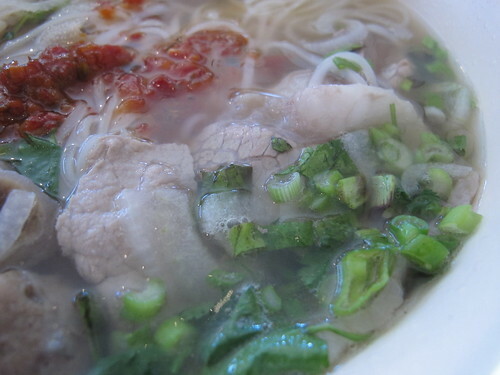 With sliced beef, tendon, tripe, and meatballs, it’s just too hard to turn down. Topped with onions, cilantro, and sliced green onions, this pho broth was lip smacking, unctuous, and armed with a bit of a fatty texture. On its own, the broth didn’t have an overwhelming beefiness, but even with small tastes of anise and cinnamon, it was hard to pick out main flavors. Although the ingredients eluded me, the broth was still quite good when mixed with a little chili garlic sauce and fish sauce. The tripe was nicely shredded, the soft tendon was just tender enough, and I was surprised to see the fat cap still on the slices of brisket. 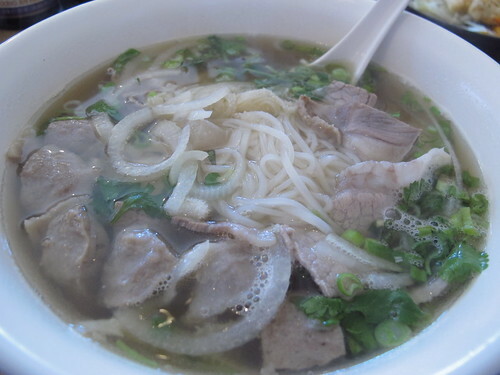 Although there was plenty of beef for such a smallish bowl of pho, the beef was on the chewy side even for brisket. As I got back in the car for the drive to Nashville, the question that most weighed on my mind was did Green Bamboo fill the void of Asian cuisine for the long weekend ahead? On the face of it, yes. 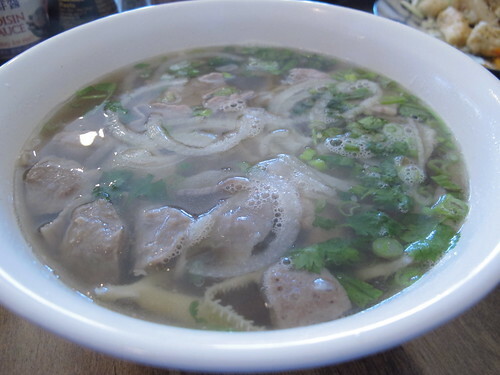 Although $9.50 is on the high side for a bowl of pho, even a dac biet with this much beef, Green Bamboo still offered a variety of quality dishes many with bold if a bit elusive flavors. I still need to do a little more digging into Memphis’ selection of pho, but Green Bamboo was a fair start to both journeys.